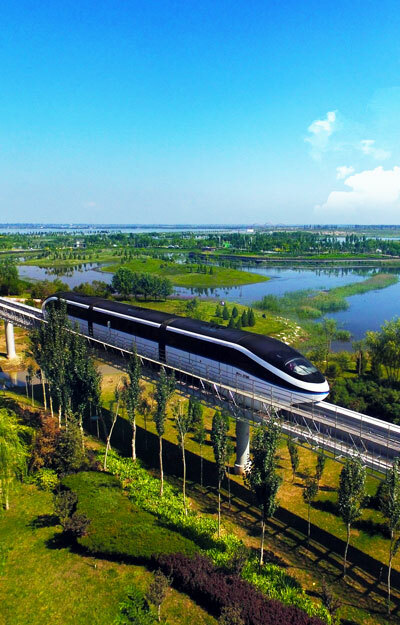 BYD’s SkyRail is a fully integrated, driverless, state-of-the-art straddle type monorail system that incorporates all of the features needed for rigorous line-haul urban transit applications. With nearly 90 percent of urban trips made by private automobile, throughout the country our major cities continue to suffer from increasing traffic congestion. And as population and economic growth continue, forecasts consistently show that congestion will only worsen, in spite of major transportation investments in highway improvements and rapid transit, and adoption of important non-capital intensive solutions such as staggered work hours and Smart Growth. In response, voters in many of our fastest growing cities have passed tax measures dedicated to implementing new bus rapid transit and light rail lines. While this has been a very positive development, unfortunately, almost all of the lower cost (primarily at-grade) transportation rights of way already have been developed – driving policy makers to consider far more costly elevated and underground alternatives. Not only are elevated and subway rail transit lines extremely costly, they also can create significant community disruption and take much more time to implement, at the same time that congestion continues to worsen. And, traditional federal sources of capital grant funding have seemingly disappeared. So what is the solution? For all these reasons, planners and decision makers have no choice but to turn to elevated solutions that would operate along major highway and freeway corridors and literally could double the passenger carrying capacity of these corridors. Unfortunately, however, elevated bus and rail systems are intrusive, costly to build and operate, and hence, are very difficult for residents to support. 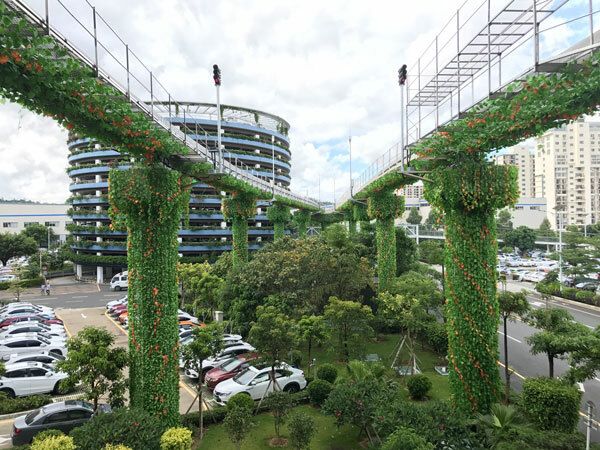 This challenge can be met by implementing much lower cost, faster to build, less intrusive, proven, reliable, state-of-the-art straddle-type monorail systems — and by implementing them through Private-Public Partnerships (P3s). P3s can greatly accelerate project completion, while at the same time delivering high quality, reliable systems that leverage public revenue streams through private sector financing. BYD’s SkyRail is the world’s most advanced and attractive such system, and as such, it is the most important element of the solution. The elevated fixed guideway means there is no at-grade passenger or vehicle collisions. Fully compliant with all applicable codes and standards, including NFPA 130 spec emergency evacuation walkway. 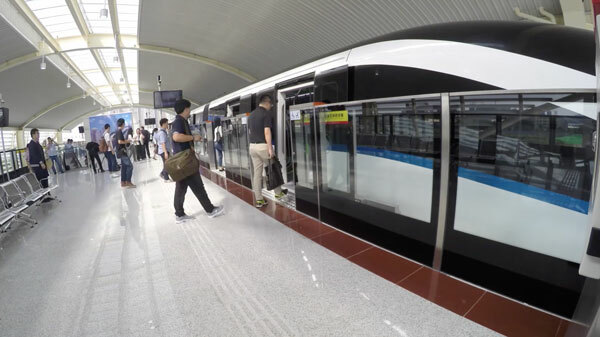 Emergency backup batteries onboard – BYD’s Iron phosphate batteries are installed in all trains in the event of a regional power-outage, trains can still operate to the nearest station to safely discharge passengers. It also means, power rails are not required in maintenance facilities, greatly reducing electrical arcing risk to maintenance personnel. 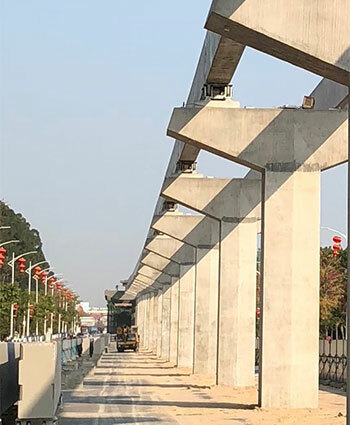 Unlike any other comparable technology, SkyRail’s aerial structure provides both the structural support as well as the vehicle guidance in one slender (27.5 inch wide) guide beam – not an intrusive “bridge” structure. This makes the footings much smaller and easier to fit into congested corridors with fewer utility relocations, while minimizing costly, time-consuming, and often contentious property acquisition. Uses pre-cast structural elements – including columns and beams – which greatly speeds the construction process and minimizes traffic and community disruption. As a result, SkyRail is much less costly to construct than conventional elevated technologies and a fraction of the cost of subways. Smaller, much more efficient aerial structures. The aerial structure itself is nearly maintenance-free, with no rails to inspect and maintain. The guide beams themselves are passive, utilizing long life, pre-cast concrete construction. SkyRail vehicles operate in a clean, controlled environment and are much easier to maintain. Through millions of miles of service, the maintenance regimes and inspection requirements are known and very straightforward. All of the on-board equipment is readily accessible, and proven, transit grade components are used throughout. BYD’s SkyRail offers a completely integrated, zero emissions, highly energy efficient power supply and distribution system. The energy created through on-board regenerative braking is stored in wayside batteries and high power capacitors to ensure that the regenerated energy will be saved and passed on not only to other vehicles operating on the line, but also to the passenger stations and to the electric power grid.. The power substations and stations can be equipped with solar panels and energy controllers to again maximize energy efficiency. As a result of these and other factors, similar elevated straddle type systems that are not as technologically advanced as BYD’s SkyRail already are covering their operating and maintenance costs through fares and advertising revenues alone, thereby minimizing or eliminating altogether the need for ongoing public subsidies. SkyRail’s wide carbody and walk through design facilitates seamless ingress, egress and passenger flow through the train. Configurable in up to an 8-car consist, SkyRail systems can move up to 30,000 People Per Hour Per Direction with trains operating on two minute headways. SkyRail is built with transit grade components throughout, including the guide beam switches it operates on. BYD has developed or improved six type of switches that can be used in a variety of routing situations to improve operational flexibility, while maintaining high reliability and availability greater than 99.97%. Straddle-type monorails have evolved over the past 60 years. Read our Proven Technology white paper here to learn more about how the technology has evolved, and how SkyRail is comprised of transit-grade, proven technology. Implementing conventional elevated transit systems can create community concerns about visual and other impacts – concerns that have arisen from viewing elevated rail transit lines cities in other cities. Given these concerns, how can a new transit system be built in an environmentally and aesthetically responsible way, and be fully compatible with the unique urban environment of the corridors through which it will pass? First, because the elevated structures required for SkyRail are so much smaller, faster and easier to build and less obtrusive, they lend themselves to implementation along busy freeway and major arterial commercial corridors, without taking highway lanes, thereby placing them in much less impactful locations, away from sensitive neighborhoods. Second, because the structures are so much lighter and less obtrusive, their visual impacts are far less. Third, because the SkyRail trains operate so much more quietly, far quieter than the existing roadway traffic, and much less noisy than light rail trains with their mandated bells and horns and their wheel squeal on curves, stations can be integrated into the urban environment much more readily. Because of this holistic approach and unmatched resource base, BYD can provide high quality, reliable, attractive SkyRail systems rapidly and with high quality, at a competitive and fair price, including complying with Buy America, hiring and training a local, diverse workforce, and working in partnership with organized labor; all of which BYD already is doing with its electric bus business. Thank you for your interest in SkyRail. For more information please contact one of our SkyRail team members at (213) 748-3980 or email skyrail.us@byd.com. Thank you for your interest in SkyRail. For more information please contact one of our SkyRail team members at (213) 748-3980 or email skyrail.us@byd.com.